Maybe you are like me. 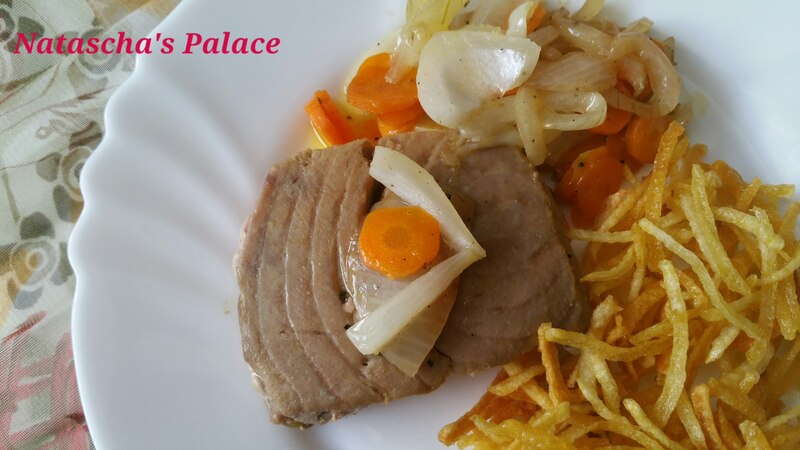 You are thinking, ¨What the heck is ¨escabeche¨? I was asking myself that yesterday and I discovered that it comes from the verb ¨escabechar¨which means ¨to pickle¨ I know that sounds like a nasty thing to do to fish but before you leave this page, what you actually do with this is slowly cook the tuna in pickling spices such as rosemary, thyme, pepper, garlic, sherry vinegar, and a laurel leaf. It absorbs the flavours of the onion that it is cooked with too. I had my doubts about this but then I trust where I got the recipe from. I got it from a website called Webos Fritos. This website has a gorgeous collection of recipes, in Spanish of course, and I have never made anything that she published either online or in a book that I did not like. This recipe is based on her mother´s recipe. It is just delicious. I used two medium, thick slices of tuna steaks. I was a bit stunned because she used 1 whole head of garlic! I chose to use about half a head, which was about 5 small cloves. Please don´t panic. It did not taste like garlic tuna! I did not chop them. I just put them in. 1. Clean and dry the steaks well. Put salt and pepper on both sides. 2. Put the onion slices and carrot slices in a casserole pot..
3. Add the laurel, pepper, thyme, rosemary and garlic. 4. In a seperate frying pan, heat the olive oil on low to medium heat and fry the tuna for for ten minutes. The timing really depends upon the size and thickness of your steaks. Just make sure they are well done! This is the key to a good escabeche. 5. Remove the steaks from the frying pan and place them on top of the vegetables in the casserole dish. Pour the frying oil on top of the fish and vegetables. Now add the water and vinegar. Set the temperature on high and as you see the liquid begin to boil, lower the heat. It will be ready in about 35 to 45 minutes or so. (Again, consider the size and thickness of your steaks)My liquids completely evaporated and it was lovely. Next time, towards the end, I would cover the casserole dish so that the fish is a bit more moist. Still, it was just fantastic. That is what is so interesting about cooking. Always more to learn! * This is something that tastes even better the next day. * This can also be done with other fish but you would have to decrease cooking times. I have to look into that! *Serve with some homemade chips!